THE ULTIMATE STUDENT COOKBOOK is the cooking bible for all students; something every student needs at university and every parent wants their teenagers to have with them as they embark on life away from home. The book is brought to you by studentbeans.com, the number one leading student website, and focuses on eating and living well as easily as possible and on a budget. This book offers a range of delicious recipes, from the very basic for complete beginners to more advanced meals for every occasion from dinner parties, hot dates to brain food for revising and comfort food that mum would have made. Along with these it includes some quirkier recipes such as chocolate mousse in a mug, or how to conjure up their favourite high-street dishes such as Nando's Peri Peri chicken or a sloppy Giuseppe pizza. 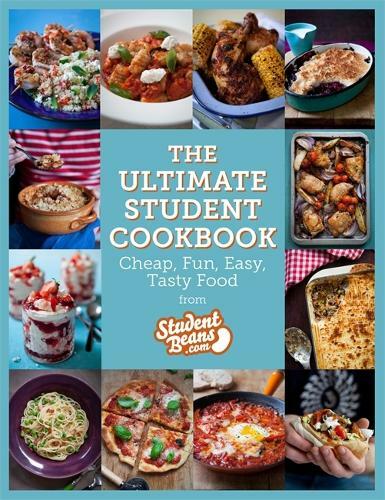 Written in the friendly, entertaining way that studentbeans.com is known for, including advice on the basics of cooking, how to save money and trips to the supermarket, this book will help students everywhere have confidence in the kitchen so that cooking becomes a rewarding, sociable part of student life.